San Francisco's world famous Cable Cars operate on the northeast side of San Francisco. Cable cars connect many of the popular tourist attractions in the City, including Union Square, Nob Hill, and Fisherman's Wharf. Invented in and for San Francisco, cable cars are pulled by a cable that runs in the middle of the track. 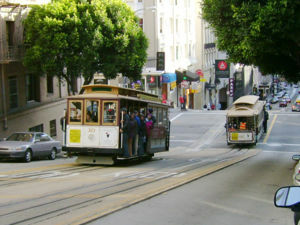 Cable cars can therefore climb the steep hills in San Francisco. In the past, San Francisco had a much larger network of cable cars. Today, only three lines remain. All cable car lines stop near Market Street with connections with Muni historic streetcars, Muni Metro, and BART. Riders can board cable cars from the terminus or at stops along the line (if room is available). Usually there's a line at the terminus to board the cable cars. Cable car tickets are sold from kiosks at terminals on the Powell street lines. When boarding without a ticket, fare can be paid with cash or Clipper card with the cable car conductor. Cable car fares are higher than regular Muni fares. Muni transfers are not accepted on the cable cars. Cable car tickets are not valid on other Muni services. Most stops outside the terminus require riders to board or exit the cable car on the traffic lane away from the curb. When boarding from these stops, wave to the crew member, and wait on the sidewalk until the cable car stops completely. Motorists are required by law to stop behind the cable car when it is stopped for loading and unloading. Seatings are limited on the cable cars. Riders may stand on the running boards and hold on to the poles. Stay clear of yellow floor area for crew members to move and operate the car safely. Cable cars are not wheelchair accessible due to the historic nature of the vehicles. This page was last edited on 29 August 2018, at 10:51.